With its leather-backed collar and warm, tartan lined inside, the York is a vest fit for a grand old duke. It’s made from Australian oilskin – so it’s waterproof, and will keep your vital core warm and dry it rains. The York features three internal pockets and three externals, including two roomy, corduroy lined hand pockets. 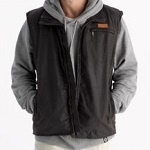 The vest closes with a heavy-duty YYK zip. – Waterproof, rugged Australian oilskin to keep you dry. – Gold and brown tartan to keep your core temperature cozy. – A total of six pockets, including two leather trimmed, corduroy lined hand pockets.